"Babumushai!' He called me with love in his voice at my recent visit to him." What happened you are looking depressed?" " Am I, " He rubbed his face,looked into the mirror as if I looked what he was hiding his real emotions of pain. Doctors had already made this news public Orkut's days are numbered. I tried to console myself so that he wouldn't feel bad but as I looked into his eyes all those years of our togetherness came in front of me and tears started flowing automatically. He became upset," Oh! That means you know all." " Yes," " and now you will try to give me your shoulder to cry, to curse my fate, to blame my stars, you will now give me sympathy and some tears of separation. I don't need such type of treatment. Whatever time I have I want to enjoy it. I wants to see everyone smiling. I wants to distribute happiness in this little time left with me. I wish people remember in me a face which not only smiles but also spread smiles." "Orkut! Isn't it any hope?" " Love arises hope my friend and that lovely thing was snatched from me long time ago and after my death news people are coming only to take away their belongings kept with me. That love was lost long time ago"
"But aren't you shocked with sudden news that you are going to die?" " No Babumushai! Zindagi aur maut to uppar wale ke haath main hai ,hum sub to uske hato ki kathputliyan hain, woh kab kahan hamari dor kheench le koi nahin janta. ( Life and death are in God's hand. We are puppets in his hand. He can cut our roles whenever He wants.)" That Anandish Orkut was hiding his pain, there was a time when he was apple of everyone's eye but as they say change is permanent he couldn't coup with the change and declined in status and health. Something which remained our integral part became useless after sometimes. This is the law of the nature old gives way to the new. Being unable to say anything I left him to adjust to the situation and accept the reality. He still wanted to spread happiness in the world which I think would ease his last days. Soul is immortal it will change its form if something interesting is available. Wow..that was different. 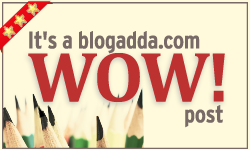 Blog Adda's prompt this time..made all of us very nostalgic.